I’ve been playing Marvel Puzzle Quest for the last several weeks, especially in waiting rooms and during quality time with my family. It’s a free to play, match 3 puzzle game (think Candy Crush Saga) blended with Marvel super heroes. One of its key mechanics is building a roster of heroes, which you do by getting random comic book cover drops. Find a Spider-Man cover, for example, and you can recruit him to your superteam. You want as many heroes as you can get, since you never know when you’ll encounter an in-game event where you will benefit from having a particular character. My stack of soon to expire comic covers. This being a free to play game, there are two pain points associated with this system that can be alleviated by spending in-game currency. First, you can only have so many heroes on your roster, but you can expand that limit by purchasing additional character slots. Second, the new hero covers that you find have a time limit; you have to use them or watch them go away forever. So you may find a 3-star Rocket & Groot card, but you can’t actually use it unless you pay to make room for it in your roster. You can also sell the new card (or an old one to free up room), but that’s essentially the same as letting it expire given what little you get for it. Each time you find a new cover you have 5 days to to act or it’s gone. This sets up a well documented psychological quirk that makes people more likely to part with their money. Ariely and his colleague Jiwoong Shin also did another study on aversion to loss and reluctance to give up options.2 The study has to do with what’s called “psychological reactance.” In short, we hate to lose options and will often give up more than an option is worth in order to retain it. 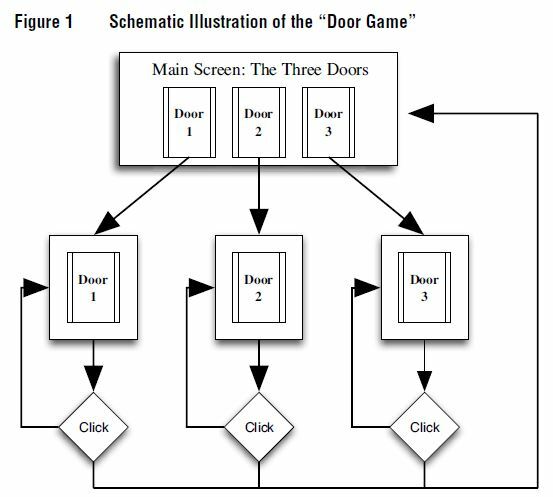 The researchers created a little computer game where participants could choose between three doors –red, blue, and green. Players had only 100 mouse clicks to “spend” in the game by clicking to navigate between doors and then clicking in the rooms on the other side of each door. Clicking once inside a room yielded a random amount of money within a certain range. The red room, for example, could pay between 3 and 9 cents for each one of the player’s limited clicks, but the blue room may pay between 8 and 16 cents per click. Only the players didn’t know the ranges; they had to experiment to determine the optimal way to play the game and maximize their payout. But here’s the trick that the makers of Marvel Puzzle Quest would appreciate: If a player ignored a certain room for 12 turns without clicking on it, the door to that room would shrink and eventually disappear –gone was that option forever! But players could “reset” the door by clicking on it just once before it disappeared (an act that cost 2 clicks without generating any money). Taken from Shin and Ariely (2004). Unused doors would shrink each turn and eventually disappear if not navigated to and clicked at least once. But could we use psychological reactance in a truly evil way? Yes. Yes we could! If the developers of this game wanted to be really evil, they would offer me an option to immediately recruit a hero for 200 Hero Points. And then to really take advantage of psychological reactance, they could gradually raise the price the closer the hero gets to expiring so that it would cost, say, 350 when I have only a couple hours left. Maybe 400 in the last 30 minutes. I bet revenue would go up, and THAT would be something truly worthy of a comic book villain. 1. Ariely, D. (2010). “Paying More for Less.” In The Upside of Irrationality: The Unexpected Benefits of Defying Logic at Work and at Home. (New York: Harper). 3. If any of this sounds familiar, I used the same study to illustrate the stress caused by choosing between NPC romances in Bioware games. I, uh, even mostly copied and pasted some of the above text from that piece. Sorry. 4. For example: Hawkeye? I spent five dollars to make sure I didn’t lose the opportunity to have Hawkeye in my roster? Ugh. ← Red vs. Blue: Which Should You Choose? Really interesting! Can’t wait for your book! Does it really work if the player doesn’t know “is it worth it?”. E.G. If player doesn’t know if the Rocket & Groot card is good (no stats, no level or stars), the only information that he gets is the image and name of the card. I would think so, unless he has reason to think it might not be. If some cards are truly junk, for example. And this happens with all the one-star cards you get in the game. Once you have a roster of two, three, and four star cards those one star ones are just ISO-80 (the game’s OTHER in-game currency) in a less convenient form. You sell them. Dragon Vale did something similar, but with a different approach. They introduced new rare dragons weekly/monthly that you could buy for hard currency, and if you’ve missed the event, say bye-bye to that rare dragon. 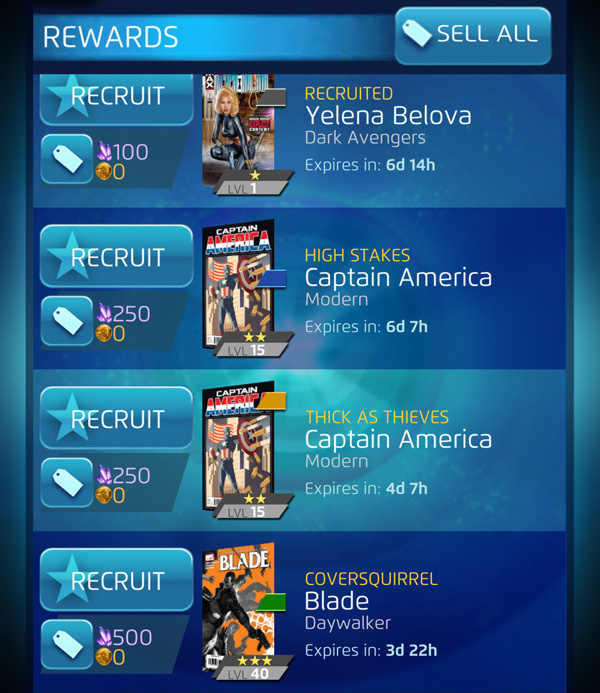 Very interesting post, I linked it over in the MPQ forums to share with others. I’m on day 495 of playing. It hits all the right beats for me. Marvel Heroes & Match 3. Thanks, some good discussion in that thread!